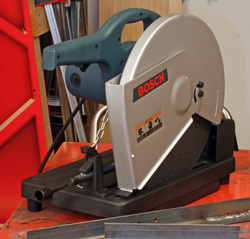 See what tools that the NewMetalworker.com viewers liked best in 2010! The inaugural Top Ten Metalworking Tools list shows that NewMetalworker.com viewers are just as interested in getting value for their tool dollars as are their counterparts at NewWoodworker.com. Obviously we do not have the sheer magnitude of viewer numbers that NewWoodworker.com enjoys but the same formula was used to rank the Top Ten Metalworking Tools. Page views and the number of emails directly relating to the specific tool reviews decided the order in which this group was ranked. I wasn’t sure how prominently welders would rank amongst metalworking tools but NewMetalworker.com viewers made it very clear that they have LOTS of interest in welding. The Lincoln Pro-Mig 180 Welder was the first welder I reviewed on NewMetalworker.com but its numbers in terms of page view and emails consistently put it at the head of the field. In their emails NewMetalworker.com viewers mentioned the popularity of the Lincoln name and its wide spread availability. But the most common remark was the Lincoln Pro-Mig 180 Welders reputation for solid performance and ease of use. Those qualities and the street price made the Lincoln Pro-Mig 180 Welder the most favored tool by NewMetalworker.com viewers in 2010! 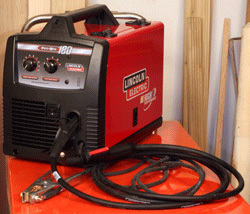 Click Here to see my full review of the Lincoln Pro-Mig 180 Welder! 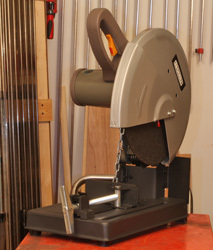 Running a close second in this years Top Ten Tools list was the Hobart Handler 125 EZ. The NewMetalworker.com viewers liked the name recognition and quality along with a very good price for this factory reconditioned welder. Incidentally, many emails indicated that the NewMetalworker.com viewer had bought the Hobart Handler 125 EZ new and still appreciated the street price. Hobart has a good reputation and the combination of that and the Hobart Handler 125 EZ running on regular 115-volt house current opens the door for many more potential users. 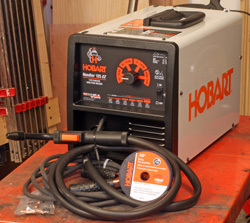 The fact that this machine does not require an expensive bottle of shielding gas made the Hobart Handler 125 EZ a favorite of many NewMetalworker.com viewers in their home-based shops. Click Here to see my full review of the Hobart Handler 125 EZ! Cutting metal is a common task that NewMetalworker.com viewers want to accomplish more easily so the Milwaukee Compact Band Saw was a good fit. The Milwaukee name certainly did not hurt anything either! The surprising capabilities of the Milwaukee Compact Band Saw along with the speed at which it cuts and the accuracy it offers were all important to NewMetalworker.com viewers. The ease of use (including changing blades) is very attractive as is the surprisingly low street price for the Milwaukee Compact Band Saw. Here again, value for the tool dollar spent won over the NewMetalworker.com viewers! 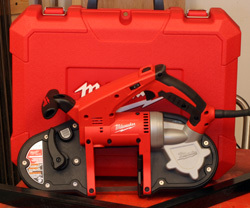 Click Here to see my full review of the Milwaukee Compact Band Saw! You can buy bench grinders just about anywhere but the NewMetalworker.com viewers apparently like a name they know and can trust so the JET 8" Bench Grinder turned out to be very popular with them. There is nothing fancy about this grinder but it is very solid, well-built plus actually does what it says it can do and NewMetalworker.com viewers like that. Our viewers also like the Pedestal Stand because of its simplicity and the fact that it is made from cast iron. Combined with the JET 8" Bench Grinder this duo garnered lots of attention early on when this review was posted. Click Here to see my full review of the JET 8" Bench Grinder with Pedestal Stand! Though some consider a stick welder to be obsolete the NewMetalworker.com viewers apparently do not agree. Something I saw repeatedly in the Lincoln AC225S Welder emails was that a bunch of our viewers already own the Lincoln AC225S Welder which is understandable because it has been around for decades and liked by lots of people the entire time. The NewMetalworker.com viewers like the simplicity of the Lincoln AC225S Welder along with the wide range of material thicknesses it can handle. This welder has been a favorite of farmers, small businesses and amateur race teams for a long time and now it is a favorite of the NewMetalworker.com viewership as well! 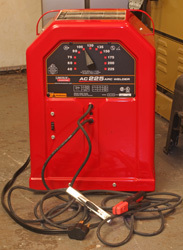 Click Here to see my full review of the Lincoln AC225S Welder! Another staple of the metalworking shop the abrasive wheel cutoff saw reviews grabbed lots of NewMetalworker.com viewers’ attention. The Bosch 14" Cutoff Machine got the nod for the most viewers and email and once again shows the willingness of the NewMetalworker.com viewers to spend a little more to get the most value for their tool dollars rather than shop purely by price. Bosch has a long history with most metalworkers as well as woodworkers and they seem to place value on that. Though the physical size and features of the Bosch 14" Cutoff Machine are very similar to other brands on the market the NewMetalworker.com viewers were paying close attention to the quality of the individual components such as the motor, gears and the table features. Click Here to see my full review of the Bosch 14" Cutoff Machine! Another of the abrasive wheel cut off machines the Rockwell 14" Cutoff Machine also got lots of attention quickly. The ability to cut a wide range of material shapes and sizes accurately is attractive to metalworkers. Between the very reasonable street price and a full list of features the NewMetalworker.com viewers showed considerable interest in the Rockwell 14" Cutoff Machine from the day this review was posted. Click Here to see my full review of the Rockwell 14" Cutoff Machine! Welding helmets have come a long way since the days of single shade tinted glass. 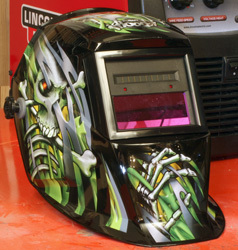 The Hobart XVS Hood Welding Helmet with its auto-darkening electronically controlled lens was an instant favorite with the NewMetalworker.com viewers. Here again I was surprised with the number of NewMetalworker.com viewers who already owned a Hobart XVS Hood Welding Helmet and continued to tout its good traits. Something else that struck me about the folks sending emails on the Hobart XVS Hood Welding Helmet was the range of experience levels. Professionals to rank beginners all report liking the Hobart XVS Hood Welding Helmet and wanted that to be known! Click Here to see my full review of the Hobart XVS Hood Welding Helmet! The Bosch Slim Angle Grinder came out on top of the group of three similarly-configured grinders I have reviewed to date. I am sure that some of that is Bosch loyalty but I have to think that the NewMetalworker.com viewers are once again looking for the best bang for their tool bucks. The actual price spread across the three angle grinders reviewed is not that great but the difference in page views and emails made it very clear that the NewMetalworker.com viewers liked the Bosch best. 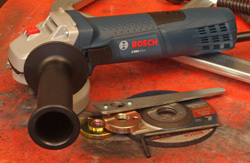 Common among the email comments was a level of surprise on the part of new users regarding the smoothness of the Bosch Slim Angle Grinder operation. Its power and overall ease of use were also noted frequently. Click Here to see my full review of the Bosch Slim Angle Grinder! Clamps might seem like an every-day utensil in the metalworking shop but the Bessey Angle Clamps got lots of attention and considerably more than any of the other clamp reviews I have done so far. That is notable because of the operation-specific use of the Bessey Angle Clamps. Click Here to see my full review of the Bessey Angle Clamps! 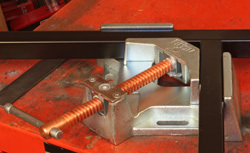 Have a comment on this Top Ten Metalworking Tools List? –Email Me!